With a little bit of paint, and a bunch of friends, bring your child’s creative dreams to life with a painting party from Artytime! You provide the party, we provide the Arty and an experience for your child and his/her friends to remember! We work with you and your schedule, and are available to host parties during the week and weekend. We cater to all levels of talent, no experience necessary. Everyone is sure to create a masterpiece of their own. All art supplies, floor and table coverings, easels,canvases and art instruction! We’ll need 30 minutes before and 30 minutes after for set-up and clean up. The birthday boy/girl can request a painting idea. We provide step-by-step instruction with background music. (allow a 1 1/2 hour time slot for the painting part of your party with a break after 30 minutes to allow for background paint to dry before applying the foreground). 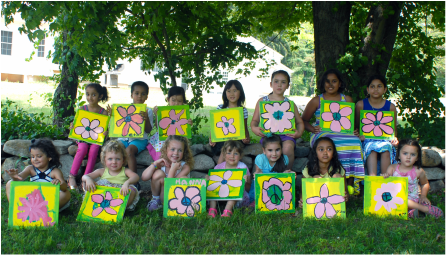 Each child will take home a masterpiece on a ready to display canvas. NO PARTY FAVORS REQUIRED! Click to reserve your party today! A 5th Birthday party filled with flowers! Artytime was a fantastic activity for my Girl Scout troop. It's not always easy to find an activity that appeals to the whole troop of 13 yr olds, but all the girls loved the activity & loved Wendy! It was nice to hear them support each other and compliment each other's artwork - so what I thought would just be a fun and relaxing activity, actually was a great bonding experience for the girls. I highly recommend Wendy and Artytime! There is a 10 child minimum. Parties are for 5 years old and up. You provide food and drink (cake etc), we will take care of the creative experience! This package is $250 minimum, $10 for each child over the minimum. 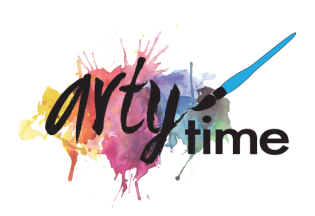 Please call 646-345-0178 or email wendy@artytimeparties.com with any questions or to book your party today. Tell us a little bit about your party in an email (date, time, number of guests etc.) and we will call you to get the party started! $100 deposit to reserve your date and time. Discount for Non-Profit organizations such as Girl Scouts, etc. Please inquire when booking. A fabulous evening of painting fun with Artytime! Thanks, Wendy Sommers! An 11th Birthday Celebration. Starting with some basics, these girls personalized their paintings! "Creativity is contagious, pass it on!"